Alexander Brailowsky was born in Kiev on 16 February 1896. After initial instruction from his father, a professional pianist, he began studies at the age of eight with Leschetizky pupil Vladimir Puchalsky, who would later mentor Horowitz. Upon graduation from the Kiev Conservatory in 1911 where a visiting Rachmaninov predicted that he would have a great future, Brailowsky went to Vienna to study under Leschetizky himself, and made his first public appearances there in 1913. In Zürich, he met with Busoni and sought out his guidance. Moving to Paris where he eventually took up French citizenship, he received further instruction from Planté before making a recital debut there in 1919. It was in Paris in 1924 that he first presented a series of six concerts he devised containing all 169 solo piano works by Chopin, using the composer’s own piano for part of the recital. He repeated this program in Brussels, Zürich, Mexico City, Buenos Aires and Montevideo, and established a reputation as a Chopin specialist, even though his wide repertoire ranged from Bach to Bartok. His American career also began in 1924, and included a coast-to-coast tour in 1936, as well as a repeat of his Chopin cycle during the 1937/8 and 1946/7 seasons. During the latter season, he set attendance records in New York. For the sesquicentennial of the composer’s birth in 1960, he repeated his Chopin cycle a final time in Paris and Brussels. He gave his last recital at Carnegie Hall in 1967, and died on 25 April 1976. 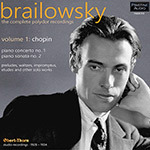 Brailowsky made his first disc recordings for Polydor in Berlin between 1928 and 1934. He also recorded a series of piano rolls for Ampico during the late 1920s. After a couple sessions for HMV in 1938, he began a long association with RCA Victor (1940 – 1958) before making a final group of recordings for American Columbia (1960/1). The present release is the first of two which will present his complete pre-war Polydor recordings in new transfers for the first time in nearly thirty years. This volume focuses on his Chopin recordings from this period, including the world première recording of the composer’s E minor Piano Concerto, while the second will present his recordings of Liszt and other composers. In this release, the sources for the transfers were all German (or, in one case, Austrian) Polydor pressings, except for the concerto, which came from a mid-1930s laminated Brunwick edition pressed by American Columbia, and one other disc which came from an early non-laminated Brunswick. Considerable care has been taking in pitching the original recordings, several of which had speed fluctuations throughout the sides.